A widespread ban has come into force in France on smoking in workplaces. People lighting up in airports, railway stations, hospitals, schools, shops and offices will face fines. Restaurants and bars have until December to comply. 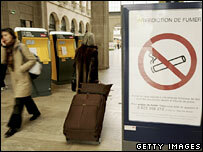 The BBC Paris correspondent says 70% of people in France say they favour the ban as do half of all smokers. France is the latest in a long line of European countries - including Italy and Ireland - to introduce complete or partial bans on smoking in public. In 2004, Ireland became the first European country to introduce a comprehensive ban in all workplaces, including pubs and restaurants. Sweden, Italy and Malta followed suit with their own wide-ranging public bans. Although there is no anti-smoking policy at European level, the EU's executive in Brussels has indicated it would welcome steps towards pan-European norms. From Thursday, those flouting the ban in France will face a penalty of 68 euros (£45) for individuals and 135 euros (£90) for companies. Employees at private companies will be allowed to smoke but only if sealed smoking rooms have been set up for them. "There could well be fines if there are people who refuse to co-operate. But I am very confident," said Health Minister Xavier Bertrand. "Smokers are increasingly understanding, non-smokers are increasingly determined, and above all there has been a striking change in attitudes." Under existing laws dating back to the early 1990s, separate smoking areas are already supposed to have been set aside for smokers, but in practice the rule has rarely been enforced. "I think that the image of the French culture, the French way of life, is not only the smoking of cigarettes. "Today there is a large consensus in French opinion for this banning of smoking and I think it will be a good thing for the majority." According to EU figures, France's figures of 26.1% of "daily smokers" is slightly lower than the 25-state EU average of 26.5%.